​Lynn Modell is a dancer/choreographer/teacher known for deft use of humor which imbues both her teaching and choreography. After graduation from Adelphi University, Lynn moved to Boston where she founded Kineticompany with three other Adelphi alumnae. 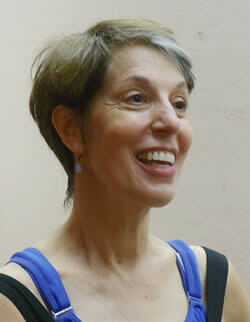 She also danced with several companies in Boston including Susan Rose and Danceworks, and Boston Dance Collective. After teaching ballet and jazz at Boston University, Lynn taught dance and choreography at Brookline High School for 27 years, serving for 13 years as Chair of Performing Arts. She received the Outstanding Teacher of the Year award at Brookline High School in 2000 and the Dance Educator of the Year award from the Massachusetts Association of Physical Education, Recreation and Dance in 2004. She now teaches dance to adults at United Parish in Brookline. Lynn presented the first dance performance of her choreography, Every Body Dances, in April 2018. Another show is planned for April 2019.